It was refreshing for me that in his plenary paper on Data Governance in an Interconnected System, Paul Madden, the Chief Information and Knowledge Officer of the Department of Health and Aging, stated that he is managing information management according to an enterprise approach in the department. With so many systems, pockets of information and repositories of data in the department, it is a very sensible approach to take, as a lot of the approaches and techniques used in managing information as an asset in complex enterprises can be usefully employed. Andy Bond, responsible for Interoperability and Standards at the National E-Health Transition Authority (NEHTA) discussed the deployment of the personally controlled E-Health record in depth. Of course, a lot of the system, governance and policy work are already far underway, with the public adoption of the E-Health record scheduled to start in July this year. From a BI perspective the E-Health record is one of the biggest “customer conformance” projects you can think of. Imagine retailers or financial institutions having a single view of ALL their customers’ transactions, across all suppliers. Now there’s food for segmentation, loyalty analysis and cross-selling! But of course, in a healthcare context the objective is very different – a comprehensive view of patients’ consultations, hospitalisations, diagnoses and treatments can save lives, especially if repeat treatments, drug misalignment and comorbidity are analysed and reported. Many presentations discussed large scale data integration – too many to list separately, in spite of how good they were. Many hospitals, research organisations and parastatal organisations are integrating huge volumes of clinical and administrative patient data. The types of knowledge that can be analysed and mined by combining these data sources are astounding. Naturally when integrating patient-related data, access security, anonymity and other aspects of privacy protection must be carefully considered and implemented. With the conference theme centred on data governance, many papers dealt with this topic, albeit on different levels of detail. Papers by Kevin Moysey and Katerina Andronis (Deloite), Megan Hayes (Mater Health Services), and David Rolands & David Thatcher (Accenture) presented thorough and useful data governance frameworks, and lessons learned in the application thereof in their respective organisations. Two common threads were that large-scale data governance initiatives must be supported from the executive level and that they have to be implemented incrementally. Similar to BI, big-bang data governance is simply not practical, both for those supporting and implementing it, as well as for the organisation as a whole to absorb its impact in embracing and adhering to it. In subsequent posts I will elaborate on some of these themes in more detail. 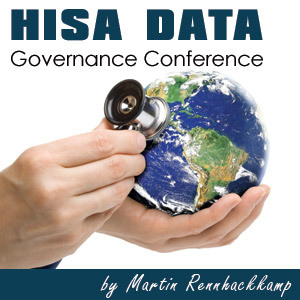 In conclusion, HISA put together an excellent conference and I look forward to the next one focused on Big Data.